The Friends of the Amazon is helping to preserve the forest, its wildlife and its native cultures in the Peruvian Amazon. We are located 3 degrees south of the equator in the Region of Loreto, which is roughly the size of Montana and is one of the richest areas in the world in terms of flora and fauna. Our team consists of lawyers, ecologists, sociologists, medical professionals and native Amazonians working together to protect the forest and its people from destruction. We use litigation, filing lawsuits against those who seek to destroy the forest and its native cultures. In addition to legal processes, we promote health, education, and the conservation of native plants and animals. The Amazon Rainforest is commonly referred to as the "lungs of the planet" whose trees are essential for absorbing carbon dioxide (CO2, a greenhouse gas that causes global warming) and converting it into oxygen, thereby mitigating the rise of global temperatures and climate change. An estimated 120 billion tons of carbon dioxide is sequestered in the Amazon Rainforest and global emissions of carbon dioxide increase with every tree of the rainforest that is cut down. That is why the survival of the Amazon Rainforest is vital for the survival of our planet, without which rising global temperatures could melt the polar icecaps and cause flooding of our coastal cities. 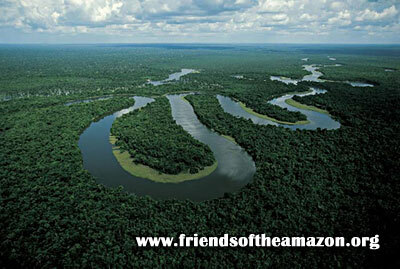 Currently, the Amazon is under siege, with an estimated 1000 hectares being destroyed everyday. After harvesting old growth forests, corporations are often replacing the native forest with palm oil plantations instead of reforesting with native tree species. Palm oil trees are native to Africa, not the Amazon, and due to high profits, their promotion by international aid agencies and recent legislation in Peru, palm oil plantations represent perhaps the single greatest threat to the native Amazon Rainforest. In addition to conventional logging and deforesting to make room for crops such as palm oil and soybeans, the Amazon forest faces a new threat in the form of REDD projects and "Carbon Cowboys." REDD refers to Reducing Emissions from Deforestation and Forest Degradation by using carbon offsets ("carbon credits"). Under the guise of REDD projects, scammers are tricking native communities into signing unjust contracts in English without legal representation which essential give these so called Carbon Cowboys the forest for free. These conmen are making false promises of "billions of dollars in profits" from REDD and voluntary carbon offset projects by lying that they are representatives of the United Nations and World Bank in order to trick vulnerable indigenous Amazonians into ceding their land by signing unjust contracts with hidden clauses that give the Carbon Cowboys a power of attorney to do what ever they want with the forest for a period of 100 years. Friends of the Amazon is actively filing lawsuits against these Carbon Cowboys and those who support them. For further information on our programs and to find out how you can help preserve the Amazon Rainforest, please contact the email address listed below.